Alumni in Class of 1936 H.S. One of the major missing pieces in the BY High puzzle was the Wildcat Yearbook of 1936. Paul L. Harmon, BYH Class of 1937, responded enthusiastically to our appeal, and has shared his 1936 Wildcat yearbook, which is in remarkably good condition. This yearbook have provided considerable information to this website. Class of 1936. Nita Black. Source: 1936 BYH Wildcat yearbook. ~ ~ ~ ~ Nita Black was born on January 21, 1918 in Ammon, Idaho. Her parents were William Shirley Black, Sr., and Verna Johnson Black. Nita Black married J. Ross Farrer of Springville, Utah, on September 27, 1941, in Nevada. J. Ross Farrer was born August 20, 1917 and died on September 20, 1952, of a gunshot wound. His interment, Mountain View Cemetery, Beaver, Utah. Nita Black Farrer died on September 29, 1994 in Springville, Utah. Her interment, Evergreen Cemetery, Springville, Utah. Class of 1936. Eva Call. Source: 1936 BYH Wildcat yearbook. ~ ~ ~ ~ Eva Call was born on June 15, 1918 in Afton, Wyoming. Her parents were Horace Arthur Call and Leona May Papworth. She married ______ Killpack, son of Perry Leo Killpack and Amy Irene Coleman. Eva Call Killpack died on March 27, 1989 in Ogden, Utah. Interment, Ogden, Utah. Class of 1936. Jack Craighead (Craghead is correct spelling). Source: 1936 BYH Wildcat yearbook. He is wearing a hat in his senior photograph. ~ ~ ~ ~ Jack Alma Craghead was born August 10, 1917 in Provo, Utah. His parents were John William Craghead [Craighead was a common misspelling] and Rosetta Irene Berry. Jack Alma Craghead married twice: First, to Helen G. Gillies on December 25, 1938 in Beaver, Utah (she died in 1975). Second, to Ruth Baerr. He died on January 5, 1995 in Orem, Utah. Interment, Provo City Cemetery. He was a World War II Veteran. Class of 1936. Douglas Davis. Source: 1936 BYH Wildcat yearbook. ~ ~ ~ ~ Is this George Douglas Davis, son of George Hillary Davis and Rhea May Daley Davis, who were married October 21, 1921 at Provo, Utah? Class of 1936. Vera Durkee. Source: 1936 BYH Wildcat yearbook. ~ ~ ~ ~ Veras Durkee [or Durkie] was born in Tennessee circa 1918. Her parents are William H. Durkee & Vera S. Durkee, and both of her parents were born in New Hampshire. By 1930 they were living in Provo, Utah. Daughter Vera had several siblings: William T., David N. [BYH Class of 1939], Mary L., John A. ~ ~ ~ ~ Possibility: Vera Durkee, 275 Steele Rd., West Hartford, CT 06117-2716 - Phone: (860) 232-2185. Class of 1936. Minnie Forsythe. Source: 1936 BYH Wildcat yearbook. ~ ~ ~ ~ Minnie Forsythe was born December 9, 1917 in Newcastle, Iron County, Utah. Her parents were N. Donald Forsythe and Georgia Hoogland Forsythe. She married Joseph Robert Jensen on October 18, 1940, in Salt Lake City, Utah. Joseph Robert Jensen was born on May 30, 1919 in San Francisco, California. His parents were Joseph Ray Jensen and Melva Hodson. He died on March 20, 2002 in Tucson, Arizona. Minnie Forsythe Jensen died on May 23, 2002. Class of 1936. Faye Graham. Source: 1936 BYH Wildcat yearbook. ~ ~ ~ ~ HER OBITUARY: Faye Graham Firmage passed away on January 25, 2012 at her home surrounded by her loving family. She was born June 5, 1916 in Provo, Utah, the daughter of Earl and Elvira Harrison Graham. She married William R Firmage on January 12, 1938 in the Salt Lake Temple. She is survived by 5 children: Susan (Spencer) Cloward, Russell Graham (Jessie) Firmage, Pamela Faye Field, Debbie Ann (Dwight) Bird and Robert Graham Firmage, 15 grandchildren, 38 great-grandchildren and 2 great-great-grandchildren. Faye was preceded in death by her parents, husband of 57 years, infant son William Graham Firmage, brother Arnold Graham and son-in-law Don Field. Faye graduated from Brigham Young High School in the Class of 1936. Faye's first love was her family. She was very active in community and civic affairs as chairman of the Federation of Women's Clubs of Utah, director of the Women's Division of the Provo Chamber of Commerce, past president and member of PHILE-NADA and charter member of the Riverside Country Club. She loved playing Bridge with the girls. The family would like to thank Dr. Sean Curzon for his constant concern and care and Janice from Applegate Hospice service for her loving care and attention. Funeral services will be held at 11:00 a.m., Saturday, January 28, 2012 at the Berg Drawing Room Chapel, 185 East Center Street, Provo, Utah. Friends may call at the mortuary Friday evening from 6 until 8 and Saturday morning from 9:30-10:45 prior to services. Interment will be in the Provo City Cemetery. Condolences may be emailed to info@bergmortuary.com. In lieu of flowers, donations can be made to the Utah Diabetes Association. [Provo Daily Herald, Friday, January 27, 2012] ~ ~ ~ ~ HER HUSBAND'S OBITUARY: William Raddon Firmage, age 79, died January 13, 1995 at Utah Valley Regional Medical Center, Provo. He was born September 11, 1915 in Park City to Edwin D. and Miriam Raddon Firmage. He married Faye Graham on January 12, 1938 in the Salt Lake Temple. Mr. Firmage attended elementary school in Spanish Fork and Provo. When Bill was 11 years old, the Firmage family moved to Provo, where he graduated from Provo High and attended Brigham Young University. In 1935-1937, Mr. Firmage served a mission for the LDS Church, serving in the British Mission in London, England and Scotland. On his return from his mission, he joined his father, brother, Ed, and brother-in-law, Stan Heal, as managing partner of E.D. Firmage Department Store in Provo. He was one of the pioneering developers of Downtown Provo. Bill was active in the Provo Chamber of Commerce. In 1950-52 he was President of the Kiwanis Club. In the early forties, he sponsored and had his own radio program, "Behold 'Tis Evening Tide." He was a charter member of the Riverside Country Club and a Veteran of World War II. Bill will always be remembered for his beautiful speaking abilities. He was an outdoor enthusiast, especially active in golf and skiing. With all of his business and civic duties, he was first and last a devoted husband, father, grandfather and great-grandfather. He is survived by his wife, Faye, two sons and three daughters: Susan Kay and Spence Cloward, Russell G. and Jessie Firmage, Pamela Faye and Don Field, Deborah Ann and Dwight Bird, Robert G. and Cindy Firmage, 15 grandchildren, 20 great- grandchildren, a sister, Louise F. Heal. He was preceded in death by a son, William Graham Firmage. Funeral services were held on Tuesday, January 17, 1995 in Provo. Interment, Provo City Cemetery. Full military rites were accorded by the VFW District #4. The family suggested contributions be made to the American Diabetes Foundation, Utah County Affiliate. [Deseret News, Sunday, January 15, 1995.] ~ ~ ~ ~ Faye Graham Firmage has written a family history book titled: Sarah Elma (Sadie) Graham Haws. Class of 1936. Genevieve Hansen. Source: 1936 BYH Wildcat yearbook. Agnes Genevieve Hansen married Harry Thomas Evans, Jr. ~ ~ ~ ~ HER OBITUARY: Agnes Genevieve Hansen Evans. Genevieve Evans passed away at home on May 31, 2010, from cause's incident to old age. She was born on January 17, 1919 to Oscar Keilgaard Hansen and Helena Demaris Anderson in Provo, Utah. She had an ideal childhood growing up in a nice home on several acres of land on what is now part of the BYU campus. Genevieve was a very intelligent child and got a double promotion in the 3rd grade and was put in the 5th grade at eight years of age. She graduated from Brigham Young High School in the Class of 1936, at the age of 17. Her father, Oscar Hansen, served as the Mayor of Provo. Genevieve married Harry Thomas Evans on May 14, 1942. He preceded her in death in 1990. She and her family lived in Long Beach, California from 1956 to 1978, at which time she and Harry moved back to Utah. Genevieve considered her greatest accomplishment that of being a good mother to her children and wife to her husband and was primarily a homemaker, although she also taught school. Genevieve graduated from Brigham Young University with a BA degree in English. She also attended the University of Utah and the University of Arizona. She had a beautiful voice. She loved music and the arts and could still sing hundreds of songs from memory up until her death. Everyone who got to know her soon learned of her quick wit and original sense of humor. She is survived by her three sons, Harry Gregory Evans, Trent Keilgaard Evans and Geoffrey Oscar Evans; two grandchildren, Leif Kemp and Destiny Evans; and seven nieces and nephews. All her brothers and sisters preceded her in death. They were: Devere Hansen, Johnnie Hansen, Ruth Hansen Hibbert, Margaret Hansen, Callie Hansen Torrance and Theresa Hansen Hammond. Funeral Services will be held at 11 a.m., Monday, June 7, 2010 at the Berg Drawing Room Chapel of Provo, 185 East Center. Friends may call at the Mortuary on Sunday evening from 6-8 or on Monday morning from 10-10:45 prior to services. Interment will be in the Provo City Cemetery. Condolences may be sent from www.bergmortuary.com [Provo Daily Herald, Daily Herald, Saturday, June 5, 2010.] ~ ~ ~ ~ Harry Thomas Evans, Jr., was born on December 21, 1921 in Somerset, Colorado. His parents were Harry Thomas Evans, Sr., and Rosamond Williams Evans. Harry Evans Jr. died on August 6, 1990 in Orem, Utah. Class of 1936. Francee Harris. Source: 1936 Wildcat yearbook. ~ ~ ~ ~ IS THIS? Francine Elizabeth Harris, born January 18, 1918 in Evanston, Wyoming? Parents: Ralph D. Harris and Elizabeth Walton. Francine Harris died July 7, 1999. ~ ~ ~ ~ Her parents, Ralph Darrington Harris and Elizabeth Walton, were married on December 7, 1914 in Provo, Utah. Elizabeth was born August 24, 1897 in Swinton, Lancashire, England. Elizabeth died March 5, 1954, in Puente, California. Interment, Oakdale Cemetery, Glendora, California. Class of 1936 ~ Honorary. Leith Hayes (not Haves). She was a BYH junior in 1934-1935, but does not appear in the 1936 BYH Wildcat yearbook, so must assume she did not graduate in 1936. ~ ~ ~ ~ Leith Hayes was born on June 19, 1918 in Provo, Utah. Her parents were John Edward Hayes and Harriet Elizabeth Jeffs Hayes. She married Mont Russell Anderson on June 16, 1941 in Salt Lake City, Utah. He died on June 5, 1981 in Bear River City, Box Elder County, Utah. She died August 5, 1999. Class of 1936. Fred D. Johnson. Source: 1936 BYH Wildcat yearbook. ~ ~ ~ ~ HIS OBITUARY: Fred D. Johnson, First Lieutenant U.S. Air Force. Born: 4 November 1918, Fountain Green, Utah, to Mr. And Mrs. John A Johnson. Died 30 November 1944. Lt. Johnson graduated from Brigham Young High School, then from Brigham Young University in 1941, earning a bachelors degree. Following his graduation from BYU, he took a year of postgraduate school specializing in chemistry. He then worked for a time for the Republic Creosote plant and the Geneva Steel plant. He enlisted in the USAF on May 29, 1943, and received his training at Kearns, Utah; Missoula, Montana; Santa Ana, California; Ellington Field, Texas; San Marcos, Texas; Lincoln, Nebraska; and Rapid City, South Dakota. He was sent to England in June 1944 and had nearly completed the necessary missions for a furlough home. Lt. Johnson was a navigator in the 95th B-17 Bombardment group. He was awarded the Air Medal for "Meritorious Achievement," an Oak Leaf Cluster, and the Presidential Unit Citation. He was reported missing in action and later declared dead during his 26th mission over enemy territory. Salt Lake Telegram, February 15, 1945. Class of 1936. Harry Jorgenson. 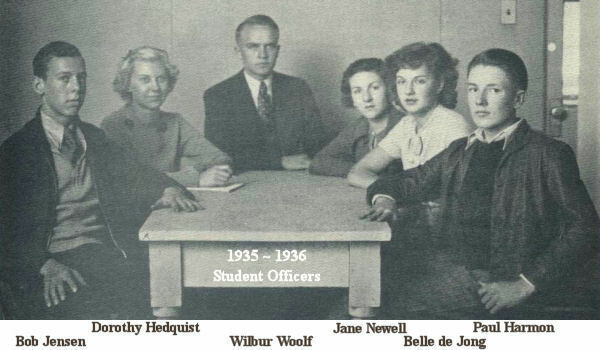 Source: 1936 BYH Wildcat yearbook. ~ ~ ~ ~ IS THIS? Harry Jorgenson born July 13, 1917; died June 6, 2004 in Derby, Kansas? [Class of 1935] Class of 1936. Helen Evelyn Matthews. Helen came to BYH from Gray, Idaho. Sources: 1935 and 1936 BYH Wildcat yearbooks. Apparently she was considered a member of the senior class in both years, but actually graduated in 1936. ~ ~ ~ ~ Helen Evelyn Matthews was born on May 12, 1918 in Declo, Cassia County, Idaho. Her parents were George S. Matthews and Nellie Anderson. She married Earnest Craig on September 24, 1937. Helen Matthews Craig died on September 25, 1997 in Jerome, Idaho. Class of 1936. Lowell Miller. Source: 1936 BYH Wildcat yearbook. ~ ~ ~ ~ Lowell Storrs Miller was born on March 9, 1919 in Lehi, Utah. His parents were Elmer Miller and Roxella Storrs. He married Blanche Thomas on December 1, 1945 in American Fork, Utah. He died on December 12, 1955, in Rochester, Minnesota. Salt Lake Telegram, September 17, 1945.